To conduct strategic research for understanding the physical processes of crop plants growing under varying soil and atmospheric environments for enhanced and sustainable agricultural productivity. To organize upgraded post-graduate research and teaching activities in the areas of Soil Physics, Agricultural Meteorology, Plant Biophysics and Remote Sensing. To maintain on-farm meteorological observatory and create agro-physical information database, for use by students, researchers and planners. To prepare real time/medium range weather based agro-advisory bulletins for the farmers of Delhi. To conduct regular training courses on Soil Physics, Agricultural Meteorology and Remote Sensing and their applications in agricultural resource planning and management at National and International levels. Tillage induced soil property changes and its linkages with growth and yield of crops. Quantification of crop-weather interaction in relation to growth and yield of crops under variable inputs. Pest-weather relationship with reference to phenology of crops and development of predictive model. Delineation of productivity of crops in Indo-gangetic plain regions using remote sensing, GIS, simulation models and relational database layers. Weather based agro-advisory services on real time basis to farmers of Delhi for agricultural operations using medium range weather forecast. Development of dynamic simulation models for soil and crop processes understanding and agri-production estimates. Designing crop growth monitoring and early warning system using Remote Sensing, GIS and Simulation Models. Regional energy and water balance estimates for resource management and sustained agricultural productivity. Biological and physical basis of growth and yield of crops. Retrieval of plant, soil and agro-meteorological parameters using remote sensing for sustainable development of agro-ecosystem. Least Limiting Water Range (LLWR) is a better indicator of soil structural quality, water availability and available water capacity. To avoid water stress, irrigation should be given at 2 MPa soil strength. Evaluated eight soil quality indices based on soil physical, chemical and biological properties and compared soil quality under different proportions of nitrogenous, inorganic and organic fertilizer applications in maize-wheat and rice-wheat cropping systems. Quantified the impact of resource conservation technologies on soil physical environment. 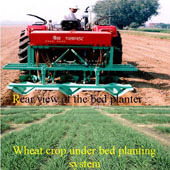 Compared to conventional tillage, higher nitrate concentration was retained under bed planting technique. Enhanced water and nutrient use efficiencies in wheat, tomato, maize and soybean were the benefits accruing due to better soil physical environment under bed planting. A simple one-layer soil water balance model was developed for calculating radiation balance components, potential and actual evapo-transpiration of crop using weather, crop and soil parameters. Physical rating index (PI) was computed by including easily determinable soil physical parameters and linked with the crop capability. PI of soil series of Delhi region was determined for evaluation of their production potential under normal water and fertilizer input levels. Under limited irrigation, application of rice husk @ 8 t ha-1 moderated soil temperature maintained better residual soil moisture status, leading to 5-7% higher grain yield and 10-17% higher water use efficiency. This technology is beneficial for rain fed wheat in India. Penetration resistance, two days after watering, could be used as an indicator of compaction instead of bulk density. A thumb rule was developed to forewarn the onset of white rust disease in mustard using cumulative hours of certain ranges of temperature, relative humidity and actual bright sunshine hours. A forewarning hypothesis (thumb rule) was developed using the degree days concept to forewarn, one month in advance, the peak of aphid and kaltenbach (Lapaphis erysimi) infestation in mustard. De-branching technology was developed for improvement of canopy micro-environment and reduction in insect-pests in mustard cultivars. Thermal response curves were developed, served as ready reference for expressing the relationship of growing degree days (GDD) with leaf area index (LAI) and biomass production and the curves can be used for predicting biological and economical yield of crop in advance. A model was developed to predict powdery mildew development in mango. Performance of two weather-based models viz., Campbell-Diaz and SPAW in predicting the soil moisture in the root zone was evaluated. An improvement was made in universally used satellite remote sensing based index called ‘Trend Adjusted Vegetation Condition Index’ for better identification of agricultural drought which not only separates the effect of weather and ecology on crops but also accounts for changes in crop production technology over time. 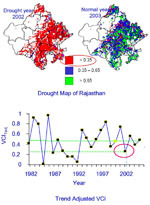 Designed, demonstrated and validated a methodology to assess agricultural drought vulnerability and map its intra-seasonal variations in Rajasthan State. The kharif season drought vulnerability can be used by planners and state agencies to prioritize areas for drought mitigation while its intra-seasonal variability can be used to design area-specific crop contingency measures. Quantitative assessment of physico-chemical parameters of soils representing different soil series and soil orders were done using Hyperspectral remote sensing technique. Based on probability of rainfall anomalies, Satellite-derived crop health, soil properties and irrigation availability, a methodology was devised to map the proneness of crop area for early, mid and late season agricultural drought. The agricultural drought proneness was mapped for the states of Rajasthan, Madhya Pradesh, Gujarat and Maharashtra. Identified the trends in crop phenology parameters for Indo-Gangetic plains using 20-years Satellite remote sensing data. The kharif season in general, is showing an increase in duration, early start of season and early occurrence of peak vegetation stage. In contrast, rabi season in general is showing decrease in duration, and delay in start of season and also occurrence of peak vegetation stage. Homogenous fertility units were generated through use of remote sensing data and recommended dose of N:P:K were worked out for targeted yield of rice, wheat and maize crops using QUEFTS model. A one-dimensional index (Total Information Content Index) was developed for characterizing the natural resources using multi-spectral remote sensing data both from ground and space based sensors. Developed methodology for monitoring the incidence of rust in wheat and leaf folder in rice, aphid in mustard and yellow vein mosaic virus in soybean through remote sensing. The spectral indices Water index or normalized water index-1 or normalized water index-3 recorded at milking stage can be successfully used to monitor the crop water stress and also predict the wheat yield. Hybrid soil quality index developed with remotely sensed indicators found to be statistically at par with the conventionally developed index. Computation of this index at regional scale using remote sensing inputs will help in identifying sustainable cropping system for different regions. Identified the wave length for detection of yellow-vein-mosaic virus infection in soybean. Using red edge technique, predictive equation for wheat crop was developed to detect nitrogen stress at field scale. Derived cropping system and its performance indictors through simple and advanced classification techniques of hyper-temporal satellite data. A composite index called vegetation health index (VHI) was developed from the satellite derived parameters of leaf area index, leaf moisture and leaf chlorophyll for spatial monitoring of wheat health. This index is very useful for crop stress monitoring, yield prediction and for devising area specific management practices. The combinations of field strength and duration of static magnetic treatment to seeds was optimized for maize, chickpea and sunflower, which gave best results in terms of shoot and root length, shoot and root dry weights. Improved functions of root could be used for extracting water and nutrients from the deeper soil layers. Hence this technology can be used under limited water conditions. Analysis of water sorption isotherms revealed that magnetic exposure of seeds decreased the number of strong and multi-molecular but increased weak binding sites. Chiselling technology was developed to reduce the sub-surface mechanical impedance of soils. It involves chiselling of dry soil to 30-45 cm depth at 50-120 cm distance depending upon the location of impedance layers and row to row spacing of the plants. A chisel, generally mounted in place of a plow, is used to break sub-surface soil layer. The chiselling encourages deep root growth, increases infiltration of rain and irrigation water, thereby increases the water storage in the sub-surface soil and improves aeration in the root zone of temporarily water logged soil and enhanced the productivity of wheat and maize by 23 and 41 percent, respectively. It involves making of 4-20 passes of a tractor or bullock drawn roller (depending upon its weight), at optimum moisture or within 24 hours of irrigation/heavy rainfall. The compacted sandy or loamy sand soils have 30-75 per cent reduced infiltration rate and require 40 per cent less water in each irrigation. Enhances the production potential of these soils by 15 per cent. Compaction also resulted in higher moisture retention by soil and thereby the leaching losses were reduced to a large extent. Use of polyethylene mulch during winter to increase the temperature by about 2 oC while during summer season, use of straw mulching can reduce the soil temperature to the extent of 5 oC . Polyethylene mulch can reduce soil water depletion by 75% from the top layer whereas it could be 25% less depletion in rice husk mulch compared to control. The downward soil water flux from top layer can also reduce by 4.3 and 1.8 times from mulched (polyethylene and rice husk, respectively) than un-mulched plot even 21 days after irrigation. Use of polyethylene mulch in maize, soybean and chickpea can enhance production by 10 to 20 %. Bed planting with 37.5 cm wide beds and 30 cm furrows is optimum configuration which is better than conventional planting for growing 3 rows of wheat in rabi, 1 row of maize and 2 rows of soybean in kharif. This improves water use efficiency (12 %), increase nitrate retention in beds (20-40 %) depending on growth stage, increase winter soil temperature (2 oC) in wet soil and in dry soil (0.5 oC) resulting in enhanced crop yield (5-10%). The Thumb Rule, ‘lower the degree-day accumulation rates in January, higher the probable peak aphid population’ was developed and validated over a number of seasons and found valid. One can forewarn the aphid infestation level during the crop season, about 4-5 week in advance. 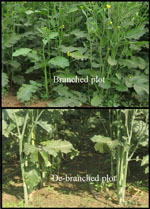 De-branching facilitated higher radiation penetration thus reduces the white rust disease and increases yield in mustard. De-branching at 50 days after sowing upto the height of 40 cm significantly increased water use efficiency (14-18%), radiation use efficiency (10-18 %) and seed yield (6-10%) as compared to control plots. Pusa gold attracted aphids first and helps in reducing the aphid attack on other varieties. Therefore Pusa Gold can be used as trap crop to overcome the aphid infestation in other varieties and hence to reduce the number of insecticides spray. It can be a viable component of Integrated Pest Management (IPM). Agricultural drought is a slow onset, complex and least understood disaster. Early warning of agricultural drought is an essential preparedness for food and livelihood security. Indicator ‘Trend Adjusted Vegetation-Condition Index’, for agricultural drought detection for early warning was developed. A value less than 0.35 indicate drought. The ‘Trend Adjusted VCI’ identified most of crop area under agricultural drought in year 2002 (shown in red colour). In contrast, year 2003 was a normal year with very less crop area under agricultural drought (shown in green colour). Developed methodology to estimate soil physico-chemical properties from ground and satellite remote sensing. Estimated N, P, K, SOC, CaCO3, silt and clay for soils in Punjab. Useful for generating soil quality and fertility maps. Helpful in recommending site specific nutrient management.